Sprinkler pipes are near the surface where the fiber drop typically runs. If they are not metallic, there is no way to "locate" them. While these are usually easy to fix, the more you can tell us about any sprinkler pipes you have, the less chance we will have to fix any. If you know where we will cross them, please put a flag. Invisible dog fences are a wire in the ground. If you tell us and put up flags or a sign we will avoid them. If we hit them they are easy to fix, but usually results in an extra trip to your site. A fiber drop is the final fiber optic cable connecting our fiber pedestal to your house. Fiber drops are generally buried just a few inches below the surface. Most fiber drops will be buried using a cable plow, by hand with a cable spade, or laid under the sod. 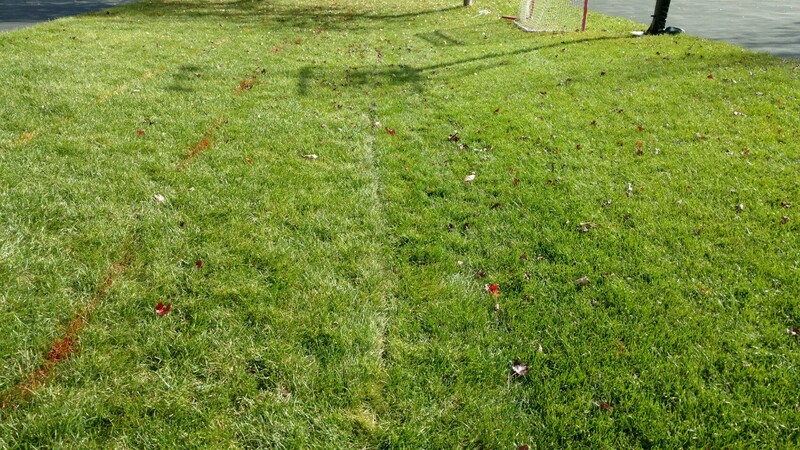 When we install a fiber drop, it leaves a "knife cut" in the sod which disappears with weathering and traffic, or after a few mowings of the the grass. In thick grass they are often immediately invisible. In new housing areas the fiber drop is generally covered when your sod is laid. If your landscaping and sod are incomplete you will find a fiber drop cable just lying on top of the ground. Your sod should just be laid on top of the cable to hide it. If the cable is buried in the soil we find they are very frequently cut by workers even though we know the workers try hard not to do this. When we leave fiber above the ground, workers using bobcats, shovels, or installing sprinklers, fencing, stakes, etc. can move the fiber drop around and avoid cutting the fiber because they can easily see where the fiber is. After a yard and sprinklers are complete fiber cuts are very rare but please remember you must call Gopher State One (811) at least 48 hours before digging in your yard and the fiber line will be marked with orange paint. When a fiber drop is cut we generally fix them at no charge unless you have not called Gopher State One (811) and of course it results in an outage to your home until we can place a new fiber drop. Fiber cuts are unpleasant for everyone, us, the workmen who cut it, and the homeowner and we have found that this policy of leaving them exposed results in the fewest cuts and issues. The painted lines are "locates". Orange is telephone or telecom. In the center of the picture is a fresh fiber drop "knife cut". In the winter a new or replacement fiber drop is laid above ground until spring. A work order is created to spade the drop below the sod once the ground thaws thoroughly and a crew is available. Drops above ground are called "temp drops". We have an excellent reputation for our lawn and landscape repair. Whenever holes are needed, the landscape will be restored to the original grade and the existing sod is placed back. Seed is added to any bare spots or edges. The seed must be kept wet and it will be robust in 3-4 weeks. If there are any spots that settle or remain bare, email us a picture. The fall and spring are the best times to fix a problem spot because of the cool, damp weather. It is the homeowners responsibility to keep the area wet, which is easier in the spring and fall. If you are doing new construction, you or your contractor are required to call 811 at least 48 hours in advance and have all the utilites marked. We have had many fiber cuts from invisible dog fence installations, fence installations, and tree installations, where they failed to call 811. Feel free to call us. The downside of inaction is your Internet will go out until we have a crew available to fix it. Any time you plan to use a shovel your must call 811 - 48 hours in advance. Sometimes the fiber drop may be as shallow as an inch or two and you don't want to knock out your Internet service.